I'm currently hosting a giveaway on my INSTAGRAM (Make sure to check it out). 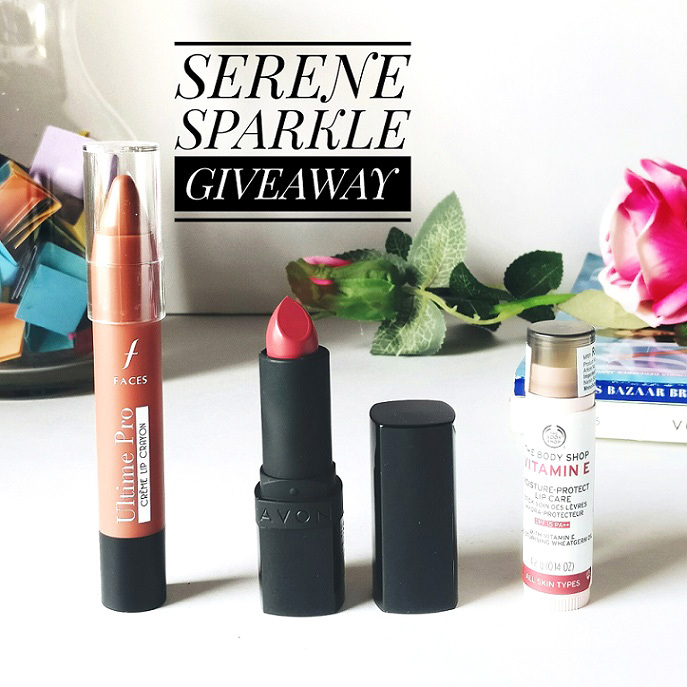 The prizes include Faces ultime pro creme lip crayon (mochalicious), Avon true color perfectly matte lipstick (mauve matters) and The Body Shop Vitamin E lip balm with SPF 15. Follow me on my Instagram (Here). Like this picture on my IG and Repost it with #serenesparklegiveaway. Tag 3 friends in the comment section of the above picture on my Instagram. The Giveaway will run until February 14 and is open to Indian residents only. It is not sponsored in anyway. Make sure to keep your profile public. Don't unfollow after the giveaway ends as this action will ban you to participate in future giveaways. One lucky winner will be chosen at random and will be announced on Instagram. Thank you for doun this amazing giveaway! Good luck to everyone entering the giveaway! <3 Those are some fabulous prizes.